There’s a way to develop a church that will provide extreme opportunity for offense—and also the promise of great power. In a hyper-grace church world, the type of message that I was rocked with on Sunday night might be dismissed or even renounced. Our ministries have become conditioned by the perceived needs and demands of the seekers instead of the demands of scripture for radical surrender. Even when discussing the concept of revival, most believe that it will enhance their churches, while in reality revival brings us back to the cross—and anything in our churches that doesn’t embrace the cross will be crushed. Revival, when it comes, may actually result in many churches closing down under the pressure of the offensive demands of the cross. Other churches will remain open but lose a lot of lesser committed people. Finances might plummet. Everything will be at risk. If we want God more than we want our churches to grow and our own personal security, then get ready for our paradigms to be violated and calibrated. At Revival Church Sunday night, God wrecked me. The Board Room—In Acts 15 we read about the Jerusalem council. The simple parallel here is that we can meet and discuss how church should be done. Come up with a great plan, follow clear wisdom, appoint leaders and let them run with a plan of action. The Upper Room—This one surprised me when God started talking about it. Of course, I love the idea of functioning out of a white hot atmosphere of prayer and prophecy. 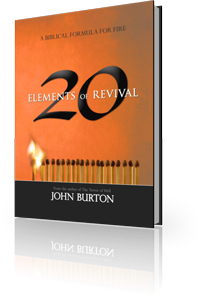 My book 20 Elements of Revival outlines this in detail. However, it’s true that there’s a certain temptation to participate in a movement that has the hopes of some power encounters, signs and wonders. We can inappropriately focus on the outward explosion while forsaking the true cost of participation. We can have upper room style conferences and churches that gather together the masses, but we’ll have limited impact if we don’t consider the next place that God spoke to me about. The Cross—Where two or three are gathered, He is there. This was never more literal than at the cross. The offensive call to full surrender, to the terrible cost of the cross, must sound louder than any other alarm. It’s rare to find churches that emphasize the extreme cost of a life in Christ. The call to the cross is inconvenient, extremely costly and wildly offensive—and few will respond. Many are called, but few are chosen. Our churches must be driven by repentance, by surrender to a fearful call. As we launch our churches with people who refuse to scatter (remember, even devoted disciples ran away from Jesus when confronted with the cross! ), and with people who actually sit at the foot of the cross in the face of severe threat to their very lives, it will be a church that cannot be stopped. The point? Start the development of your church, and continue it’s process, from the cross. Raise the bar as high as Jesus did. There’s a false doctrine in the church that rightly emphasizes that Jesus paid the price that we could not pay, but wrongly communicates that we have no part to play in the process. I’m radically concerned that MANY, MANY people in the church…in really great, Spirit-filled churches, have chosen to avoid the cost of following Jesus, the cost of the cross (Jesus isn’t the only one assigned to a cross—we are as well), the call to deep intimacy, and due to a false grace message are convinced of their salvation when, in fact, they are not saved. If we build churches around the cross, the crowds will be VERY small. Maybe only a few. Only two were at the cross with Jesus. But, the resulting victory and power will explode the church into the nations. Then, we’ll move into the upper room, and into the board room as the Church develops in wisdom and power. Yesterday’s teaching on the Prophetic Mandate is ready to listen to at www.detroitrevivalchurch.com/teaching. If we are looking to lead a generation of fire-breathers, we simply have to go deeper, burn hotter and give more then the wild radicals that are multiplying on the face of the Earth.